Whether it’s making room for Mom and Dad or welcoming grown children back into the home, there is a trend in new construction towards multi-generational households. Over the past few years, Aubuchon Homes has seen an increase in the number of requests for custom designed floorplans to meet these needs. According to Pew Research Center, in 2017, nearly 79 million adults (31.9% of the adult population) lived in a shared household. While the rise in shared living during and immediately after the recession was attributed in large part to a growing number of Millennials moving back in with their parents, the longer-term increase has been partially driven by a different phenomenon: parents moving in with their adult children. As a Design/Build firm, Aubuchon Homes employs a team of in-house designers who work one-on-one with new homeowners. During these detailed meetings, the designers listen closely to the homeowner’s needs and find ways to incorporate them into a functional and aesthetically pleasing floorplan. The idea is to make living together comfortable and enjoyable. Perhaps it’s creating a second master suite which includes a larger bedroom, en-suite bathroom, walk-in closets, and even a morning kitchen. 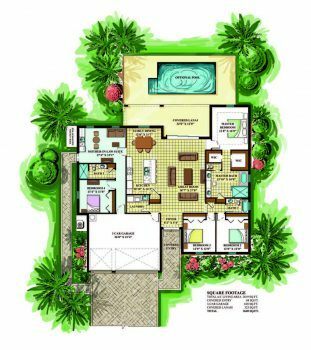 If more privacy is desired, then the custom Islander floorplan offers a flex space option. With this option, the Islander is just over 2,600 square feet of air-conditioned living space. The main living area includes an open concept great room, three bedrooms, and two baths. Just off the kitchen, a door leads to a fourth bedroom, additional bathroom, and separate living room. This space can also include a private entrance along the side of the home and access to the 3-car garage. The Islander with flex space adds approximately 600 square feet with a 4th bedroom, 3rd bathroom, separate living space, and separate entrances. From converting rooms within an existing floorplan to finding the best way to add additional square footage, the Aubuchon Homes design team can create a plan to fit any multi-generational need. Call 239.549.6358 to learn more.